And so we have sounded a new Call to Action. From May 21-29, 2015, BXE is heading back to the FERC building on First Street in Washington. We must intensify our nonviolent campaign, now, while the oil and gas industry is reeling from the massive drop in fuel prices worldwide. Business as usual is unacceptable. We must step up to block the tsunami of new fracked-gas infrastructure that is overwhelming communities across the nation. When the chairman of the FERC admits she has “a situation,” then you know that we are making headway. Chairman Cheryl LaFleur says project opponents can be categorized in “buckets.” We are not just concerned about safeguarding the environment (LaFleur’s bucket #1). We aren’t merely trying to stop something in our backyard (LaFleur’s bucket #2). We are, for LaFleur, bucket #3. In her accurate description of us, we are looking at “the bigger picture”. We don’t want more pipelines, compressor stations, export facilities, or fracking. Anywhere. Everywhere is our backyard. Poisoned land, air, and water for one community is poisoned land, air and water for all. An economy fired on the dregs of gas trapped in shale rock means that the health of nearby people and places will be sacrificed immediately. It also means the end of a stable climate for human civilization and the extinction of thousands of other species. Last November, Beyond Extreme Energy took action at FERC’s front door (and side doors and garage driveway). We wanted FERC to know that every permit, every well, every pipeline, every compressor station and every export terminal hurts families and communities. Every day for a week, we marched, sang, lay in the street, shouted, acted in silence, shared stories, made a mess of traffic, and got arrested. 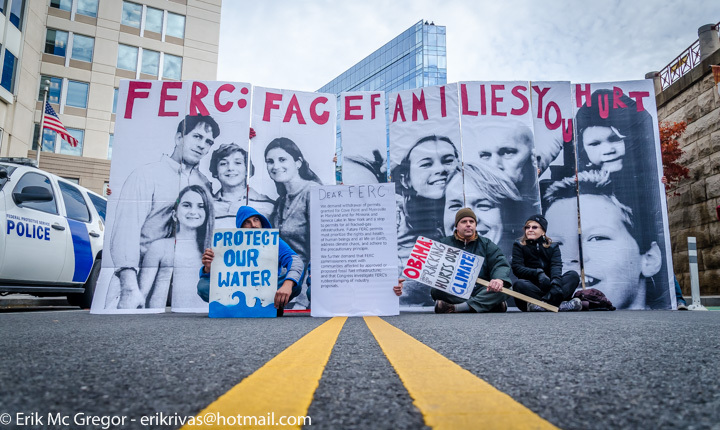 While FERC employees were on the sidewalk, blocked from their offices, our friends from fracked Pennsylvania told them their stories of harm and misery. Since then, we have staged actions, been arrested, and canvassed in Lusby, MD, where Dominion is building a $4 billion liquefaction and export facility for fracked gas on the shore of the Chesapeake Bay. Dressed as Darth Vader and Stormtroopers, we went to the Waldorf Astoria in New York City to disrupt a meeting of financial analysts and potential Dominion investors. We supported fracktivists in Pennsylvania who were arrested chanting “Ban Fracking Now” at the inauguration of Pennsylvania Gov. Tom Wolf. We demonstrated at the inauguration of the new Maryland governor, who wants to open his state to fracking. We have supported We Are Seneca Lake’s ongoing, inspiring and nonviolent direct-action campaign to stop a fracked-gas storage project in old salt caverns in the New York Finger Lakes region. We have attended every monthly FERC commissioners meeting. Chairman LaFleur, in an unprecedented move, adjourned the January meeting and cleared the room when we began speaking, one by one, about the human and environmental damage FERC’s decisions are having. Next up is an even bigger nonviolent action in May. The first day of action, May 21, is the monthly FERC meeting, and we will continue every day FERC is open until May 29. We will include a weekend of training May 24 – 25 for four days of action May 26-29. We need YOU. And your friends, too. FERC says its mission is to provide safe, efficient, sustainable energy for the country. It is failing on all counts. We want FERC to fulfill its mission and to make decisions based on what’s best for all of us instead of the fracked-gas industry. If you agree that now is time to step up, please sign up here. This time, we are coming to DC with a nine-point plan to change FERC from a rubber stamp for the fossil fuel industry into a leader in the urgent, civilizational task of reducing greenhouse gas emissions and shifting to energy efficiency and renewable energy as rapidly as possible. Join us in Washington May 21 – 29. Help us not only to bring these demands to the FERC, but also the grassroots, nonviolent political pressure to make them happen.